Available now! Click on the link below. (I cannot seem to import the image to show as an image). I hope you will get it, enjoy it, learn from it, celebrate with all of us authors whose stories are in this work, and share the information with your friends, family, and colleagues. 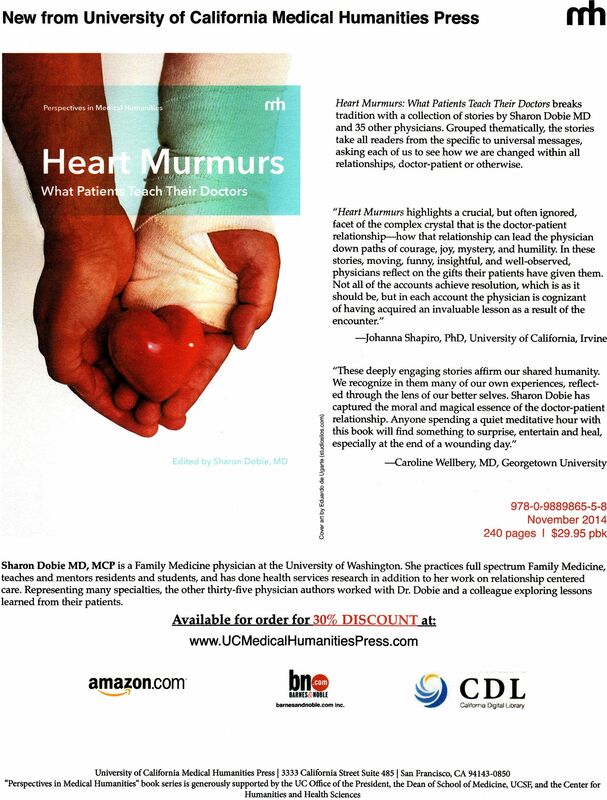 Order it from http://www.UCMedicalHumanitiesPress.com and get a 30% discount. All proceeds go to the University of California Medical Humanities Press, which allows them to publish more work in this genre. It will be available at bn.com and amazon.com in about 6-8 weeks. I just ordered Two copies! Congratulations Sharon! I’m out here at Hedgebrook and they’ll have to add your book to their collection. oh! Enjoy…same weeks in Oct I was there. I have just reread this book, cover to cover, for the 4th time. I cannot begin to tell you all the ways it has touched my heart and reached out to my soul. The stories, the relationships, the way each author puts themselves out for each and every patient, the vulnerability of the healers as well as the patients — this book is amazing. To anyone who hasn’t read it yet, move it to the top of your list!